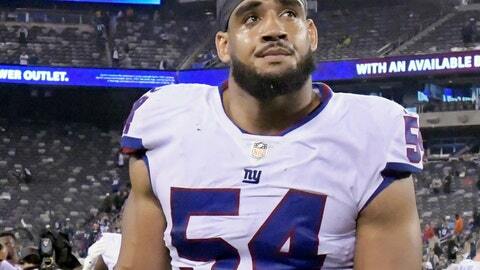 EAST RUTHERFORD, N.J. (AP) — When the New York Giants started playing games in the preseason, it seemed linebacker 0livier Vernon was going to have a monster season in coordinator James Bettcher’s new 3-4 defensive scheme. The seven-year veteran missed the first five regular-season games and didn’t return to action until a start against the Eagles on Nov. 11. The Giants were 1-4 at that point and things only got worse as New York dropped the next three games heading into its bye. It’s not what is expected of a player making $17 million this season, the second-highest salary on the team. “You work hard before every season coming up and it’s just one little bump in the road, and all I can do right now is just the normal game plan, be out there for my team and make the plays that come to me,” Vernon said Friday after the Giants (3-8) practiced for Sunday’s game against the NFC North-leading Chicago Bears (8-3). The Giants have missed him in the pass rush. They have 14 sacks this season, second lowest in the league. Vernon’s one sack is on pace to be a career low. He had 3 1/2 in his rookie season of 2012 with Miami. In his previous two seasons with the Giants he had 15, including 6 ½ last year despite missing four games with another ankle injury. NOTES: TE Evan Engram (hamstring) and LB B.J. Goodson (neck) have been ruled out for Sunday’s game. Rookie LB Lorenzo Carter (hip) is questionable.